Heard of shuffleboard? Well, back in the day, transatlantic cruise ships were full of people shuffling away on deck. And they were happy people. Because shuffleboard is great. You’ll see. The UK’s first floor-based shuffleboard club is now open. On solid ground. In Shoreditch. 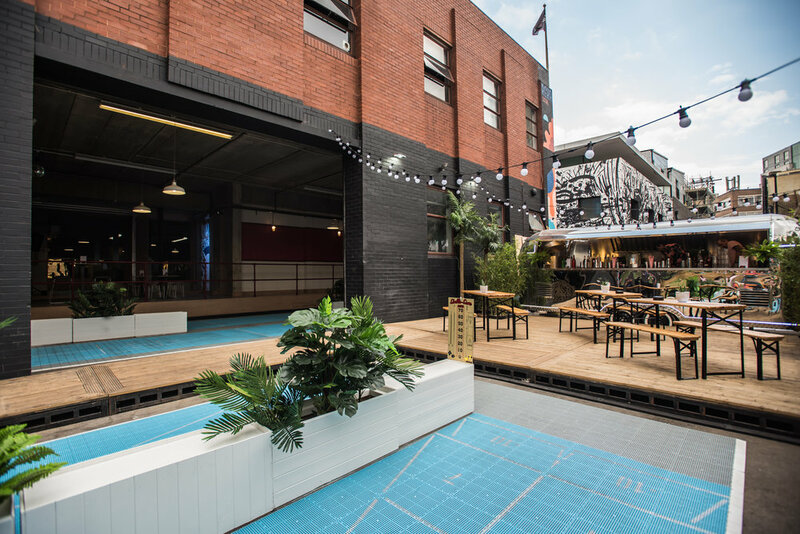 You'll find 6 indoor lanes and an amazing outdoor terrace, with 2 lanes and its very own Airstream cocktail bar. And we’re serving up pizzas, beers, and cocktails for your enjoyment while you play. Floor shuffleboard is played on ‘lanes’ by two teams, with players using a ‘tang’ and a ‘biscuit’. A tang is a long stick with a fork on the end. You use the tang to push the biscuit, which is a disc, along the floor into a scoring zone. Using those tools, teams play a number of rounds. The team with the highest number of points at the end wins. Simple. We find it works best with four to eight people on a lane – though six is the magic number. And lanes are bookable by 55-minute session for £40, or £20 during off-peak hours. Simple to split if there’s four of you. We’ll let you argue over the pennies if you’re a six. And if you're looking for a weekend Brunch with a difference, check out our Bottomless Shuffle Brunch. Your two-hour session includes bottomless prosecco, draught beers and delicious pizza with an obligatory shuffleboard taster session for all. Throw in a some great funk and soul tunes and you've got the ultimate, fun afternoon vibe. Tickets are £32.50 per person - hit the button below for more info. "brazenly risking our economy by unleashing this illicit pastime on an unwitting public once more"
Still unsure what shuffleboard is all about? Simply hit the FAQ or Contact buttons. Or both. It’s your day. Bringing shuffleboard to London, with a slice of pizza and delicious cocktails on the side.